Are you a die-hard member of The Blue Crew fan club or know someone who is? We have the most epic gift-giving idea for you! 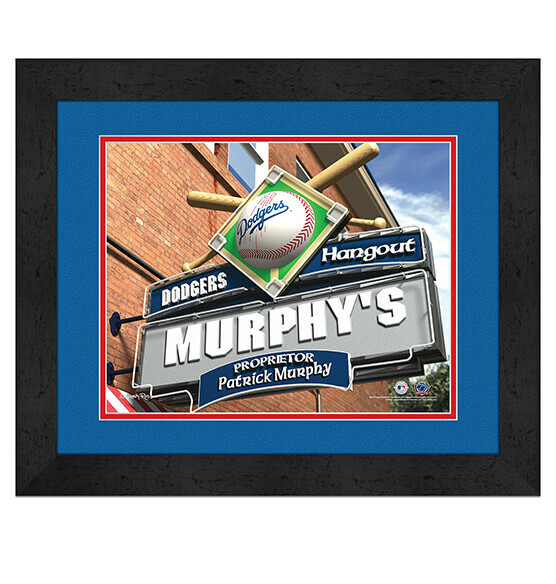 Our Los Angeles Dodgers Personalized MLB Pub Sign Framed decor is a generously sized gift for any fan who bleeds blue. This easily customizable pub sign is made to order for your specific first name, last name, or nickname requests. It features vibrant team colors, a team logo and baseball-themed accents in this "sign of a sign." Premium MDF vinyl-wrapped frame, high-quality printing and glass ensure this custom sports decor will be a fantastic addition to any home or office. It comes ready to hang with a convenient sawtooth hanger.